Just a quick note here to say that the Spark email client has just released a number of integrations with other software, and Bear is among them, so you can easily make a new note from an email. This is honestly tempting me to try Bear again, but it's not worth the "not actually editable plain text" problem that seems to be integral to Bear. Is this a regular use-case of yous, creating notes from email? Even when I compose email, I have to re-write the text to fit my archive; with incoming mail, it's even worse because a huge blockquote hardly helps in the long run. Verbatim email import never did the trick for me (successfully). It is a regular use case for me, but that's because I am, as I mentioned over on the Writing tag, using my zettel for a combination of knowledge work and project management. Saving an email is useful to me as a way of putting it into my "inbox" if I need to do something with it. @sfast we truly have the best readers and beta testers here -- who else gets to know about unsupported use cases by a user and then is told not to implement it to keep the app pure? When I decided to ditch Evernote, I was stuck with thousands of notes I had no idea how to export. I had the messed up Evernote XML files, but no way of getting my notes out of them intact. After some attempts with obscure command-line utilities and a couple of home-made python scripts, Bear was my saviour. I imported the .enml files into the app and immediately exported everything to plain text files. Even tags were included, as well as image attachments and web clippings. For this, I'm very grateful to Bear. Ironically, I can't use it. The reasons that led me to go the plain text way are far too strong to forget or ignore. I will never depend on a proprietary format or on a database. I use nvAlt on my Macs and a combination of Drafts (quick input) and 1Writer (everything else) on my iOS devices. By the way, I discovered this blog today, while searching for news on Bitwriter. I've spent the last four hours reading it. It's absolutely amazing, so rich and stimulating. Nobody can ever stress this enough: proprietary file formats do serve the devil. What does make the Evernote XML messed up? In theory, XML should be easy to process by a script or 3rd party tool, so that's puzzling! Have to try that myself one day. -- So after importing .enml into Bear, could you get your text files out of Bear, or are they now locked away there? I remember finding it especially difficult to retrieve note locations. Anyway, I’m not a programmer: just a curious designer. I’ve tried a couple of then-promising scripts and python libraries, but I couldn’t get them to work for me. I don’t know; maybe you’ll find it pretty straightforward. If you do, well, there’s another tool that would help thousands. What did solve my problem, however, was Bear. I imported in my .enml files and all my notes loaded just fine. Exporting was just as easy. (See Bear - Export your notes). I chose the plain text format, checked the option to include tags and boom! Bear creates a .txt file for each note, named after the title, and, if needed, a folder with the same name in which it places the attachments. That’s why I’m grateful to them. Despite not being able to actually use the app, Bear allowed me to recover thousands of notes from Evernote. Now, those notes are from a different era and it shows. They’re not easily retrievable, they’re disconnected, they’re all but lost. But for that, I’m the only one to blame. But unfortunately I started using Bear for my general notes (e.g. meeting minutes, recipes) and now it's filled with this stuff and I don't want to add Zettel to it. So I'm looking for an alternative to Bear either as a Zettelkasten or to switch my current notes to and the use Bear for real Zettel. 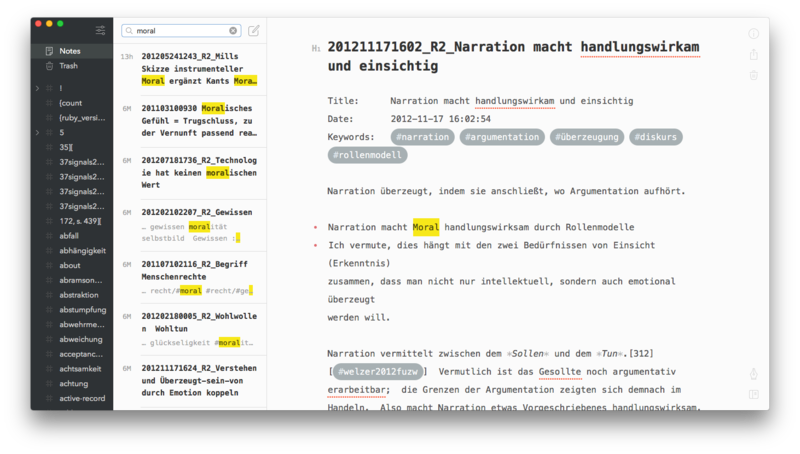 Bear supports linking of notes: enter [[ and you get a list of notes you can search in. No need to leave the current note to look up a related note. Bear lets you include images in notes. Bear supports full export to Markdown of all notes. So even though Bear keeps your notes in the cloud as a default you're not stuck with them. Bear is very reasonably priced. I find it perfectly ok to pay for a tool I use every day. Having said all this maybe I should really focus on replacing Bear as a general note taking app. Then after finding sth else I can use Bear as a Zettelkasten.